Whitney is too cartoonishly evil. Of course she was going to eat half the council and her husband; I hope that wasn't meant to be in any way surprising. Not my favorite episode of this show. Although Jarvis whispering "Abort! Abort!" into his glasses was funny. I thought they were going to ambush her from the start, especially after her husband's middle of the night phone call last week. Jarvis' reaction shots of the Peggy/Sousa talk was hilarious. Jarvis was hilarious through the entire mission though. I liked that they brought in Dottie and it'll be interesting to see how she fairs with Whitney. The look on her face when the trunk opened said fear, which isn't something Dottie showed before. Maybe they'll team up. I'm not usually bothered by words, like some are by such lovely terms as 'moist' or 'squirt'. "Sticky Wicket" is a perfectly cromulent term! It simply refers to the ground underneath the stumps in a game of cricket being exceptionally moist or gluey, causing the ball to move in all manner of directions when bowled, making it especially difficult to hit. No big thoughts on this episode - not because I don't have them, but because I watched both back to back and would hate to accidentally spoil. So... all I have to say about this one is, I love this show, and having Dottie back is a delight. I wish to contribute to a Kickstarter or something to help with this dream. It's an interesting choice to depower Peggy for a couple of episodes, but the flip-side of that is that they're really over-using Jarvis: he's much better as an occasional comic-relief foil. As a lead his mannerisms become annoying. Seems to me that Howard would be a much more obvious choice to attend the gala than Jarvis; but he's been strangely mostly absent this series, except for the one "investigating the club" episode. Was there some in-show explanation for what Howard's off doing? Howard went off to Peru (?) tracking down an old professor he thought might be able to help Wilkes. Yes.... because nothing bad comes from Peru. As a lead his mannerisms become annoying. I think I enjoy Carter more than SHIELD. It's a fun show, much more targeted. I admit, the idea that they broke Dottie out of the pokey was plot stupidity, but I loved the results, so I am okay with that. 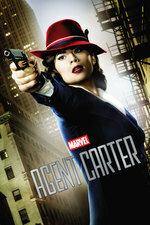 If Carter can't come back next year for any reason, and a Rose and Samberly show won't fly, I'd be a-okay with a Dottie murders nazis and commies over Europe and South America for 10 episodes, Black Widow-style (and some of the recent Winter Solder/BW comics would be ideal for that short-form story telling). Then they could bring in Jimmy Woo. This episode started out seeming like the writers just staged a Peggy-Dottie slash story they found online and amazingly it got better from there. Bravo. Oh no, not ruining Peggy's good name again thing :( Ugh, I don't know if I can withstand it. Sigh. Also, good grief, most terrible plan ever. Well I gave up on SHIELD two years ago so yeah. I am enjoying this season quite a bit. As you have no doubt heard, it did get better (especially when they beefed up the cast in season 2), although I'm a bit concerned that it is morphing into Secret Warriors. I just wish we could see more Howling Commandos, in SHIELD or Carter. The main reason that I like this show is that I'm still annoyed that Captain America jumped to the present day after only one movie and love the 1940s setting. This is my favorite show. Also - I don't think of Whitney as "cartoonishly evil." I think her husband (and fellow council members) got exactly what he/they deserved. I have been struggling this season trying to plot a reasonable way for Whitney and Peggy and Dottie to team up and take over the world. Mix a little of Dottie's communism (this opulence is disgusting), a dash of Peggy's do-the-right-and-honorable-thing, plus Whitney's brains and you've got my perfect government. I love Dottie. That is all. Sorry, still in the middle of things so I suppose this could change quickly, but I guess they are setting up Whitney and Dr. Wilkes as 1947 Cloak and Dagger?